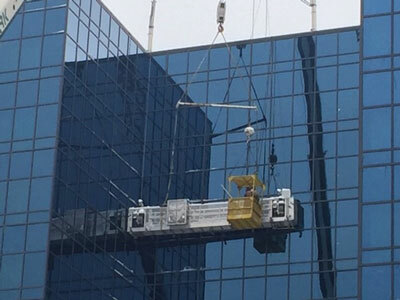 A tense situation recently occurred at the Salamanca Allegany Casino when a suspended outdoor window washing scaffold malfunctioned, stranding two workers 120 feet in the air. Luckily, no one was injured in the mishap as firefighters quickly responded and rescued the window washers within the hour. However, the window washing scaffold remained suspended as it hung precariously from the side of the Seneca Allegany Resort and Casino. Clark Rigging's Project Manager Jordan Kydd received the call for assistance in retrieving the stranded scaffold. Access to the dangling scaffold was limited, so Jordan developed a plan using two cranes to retrieve the unit. The proposal utilized a 150 ton Terex mobile crane to safely hoist a crew up alongside the scaffold. The riggers would attach rigging from the scaffold to the hook of a second larger crane - a 300 ton Terex machine, which would safety hoist the scaffold away from the side of the building. To visualize this plan and identify any potential problems, Jordan utilized 3D Lift Plan (Critical Lift Planning Software) to create detailed three-dimensional simulations and renderings of all the lifts, from start to finish. 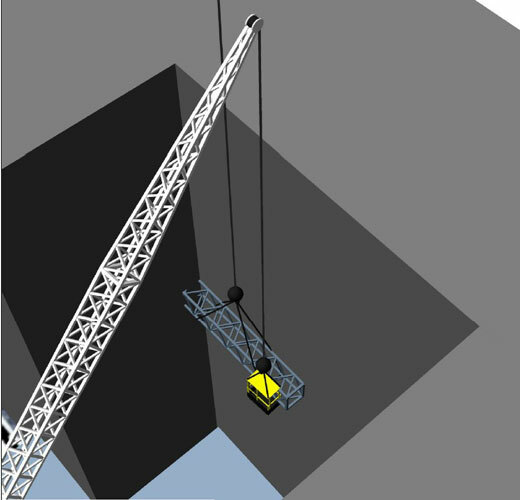 With 3D Lift Plan, potential issues can be identified and addressed in the earliest stages of a project. Clark Rigging customers can "see" a successful lift before a crane ever arrives on site, resulting in increased efficiency on the job-site and on the bottom line. 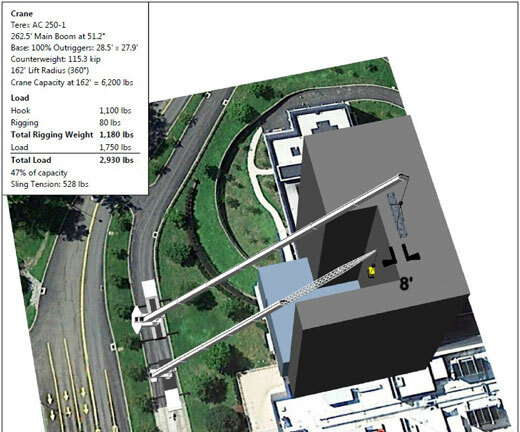 Most importantly, thorough lift planning improves lift safety by improving foresight and real-time lift accuracy. Clark Rigging understands that customers are looking for more than just equipment. They need the confidence that comes from an experienced and technologically advanced partner that will get the job done efficiently and safely. Contact us today to discuss your next project. Music superstar couple Beyonce and Jay-Z brought their "On the Run 2" tour to Orchard Park, NY for a summer stadium show at New Era Field. This event not only featured the power celebrity couple, but also one of the largest stage shows ever. Thousands of lights, giant bridges and catwalks, and enormous four-story tall video screens all needed to be transported into the stadium and safely erected in mostly tight quarters. Erecting this immense stage was an undertaking which required immense resources. Clark Rigging was asked to assist in this monumental task of setting up the stage prior to the concert, then dismantling it all after the show. Utilizing three cranes (60 ton, 100 ton, and 110 ton capacity machines) strategically positioned around the stage, Clark's equipment and crews quickly and efficiently assembled the framework of the massive stage piece by piece. 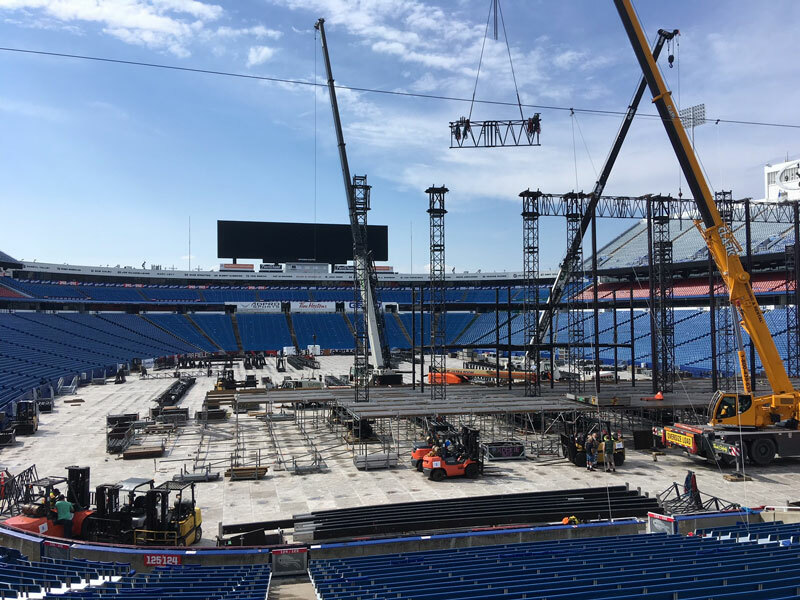 Just as stadium concerts grow bigger each year, count on Clark Rigging & Rental to grow with the needs of their customers! 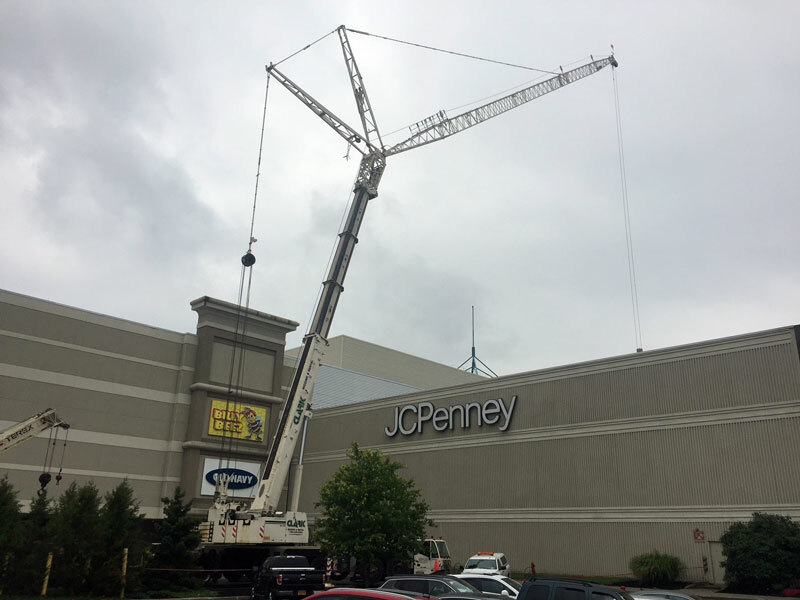 Clark Rigging and their 400 ton Terex crane was recently called upon to provide crane service to replace a far-reaching cooling tower from the Destiny Mall in Syracuse, NY. The crane was mobilized and setup with 200 feet of luffing jib and 257,000 lbs. of counterweight to safely perform the farthest pick. 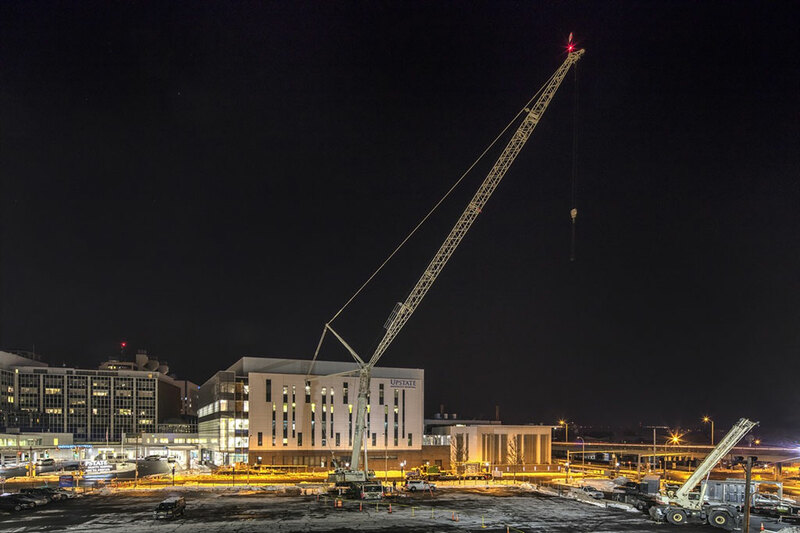 Clark Rigging kicked 2018 off with a large coordinated project at the SUNY Upstate Cancer Center in Syracuse, NY. Erie Mechanical Contractors, Inc. was contracted to replace almost two dozen over-sized HVAC units located near the center of the busy Cancer Center complex. Because of their immense size, these units presented a logistics challenge to not only get them to the hospital in a coordinated manner, but also not disrupt the daily flow of people and emergency traffic at the facility. Step 1 - Ship all new HVAC units from factory directly to Clark's Syracuse facility and store. Step 2 - Erect a 400 ton crane at the Cancer Center one day prior to setting units. Step 3 - Reload all new units onto twelve of Clark's trucks and dispatch each to Cancer Center in a coordinated fashion. 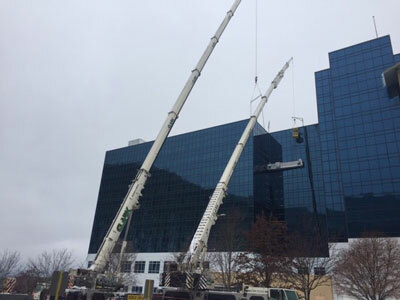 Step 4 - Use the crane at the Cancer Center to offload and set new rooftop units in place. Step 5 - Dismantle the crane and demobilize all equipment from SUNY Upstate Cancer Center. Because of the large volume of traffic typically found at the SUNY Upstate Cancer Center during daytime business hours, Clark Rigging opted to minimize their impact on the medical facility by beginning work on a Friday night and working straight through the weekend during off-peak hospital hours. After months of meticulous planning, the date was set to put the plan into action. All Clark Rigging crews and equipment were dispatched, and within 36 hours, all were back safely to the Syracuse yard with job completed as planned. This is just another example of how Clark Rigging & Rental can help you accomplish most any difficult challenge. 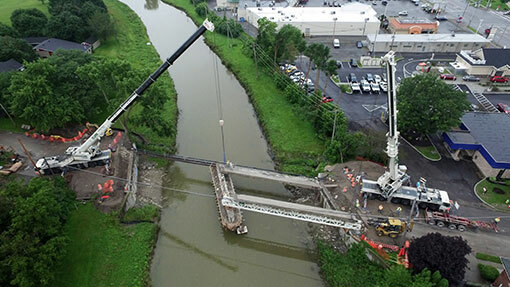 Clark Rigging was recently called upon to provide crane service needed for the deck refurbishment of the River Street bridge over Tonawanda Creek in Batavia, NY. 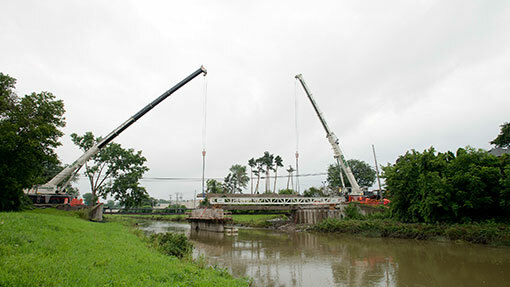 The task seemed simple - remove and replace the bridge beams with a crane from each side. However, because of the length of the bridge, large cranes with extensive reach situated on both sides of the span were needed for the removal and replacement of each concrete encased steel girder. Clark utilized their 300 and 400 ton cranes for the work. Working in unison, both cranes were used to carefully pick, slide, then load each beam onto awaiting trucks. Because of how efficiently the beam removal went, Clark was again called upon weeks later to set the new deck beams on the bridge. As expected, all went well and Batavia's newest bridge is expected to be open to traffic soon! Most of us take for granted the utilities we rely on that enrich our lives daily. We may not understand the huge utility system that’s in place to give us uninterrupted electrical service each and every day. And, when our infrastructure ages, it becomes unreliable and eventually obsolete. Therefore, utility companies must continuously invest in new critical components to assure uninterrupted service for us all. The Clark Companies are also investing in the tools and equipment needed to assist the utility companies in the installation of these valuable components. In a recent example of this, Clark Rigging was contracted to remove and replace a 200,000 lb. transformer for National Grid in a live powered, fully-functioning switch yard. 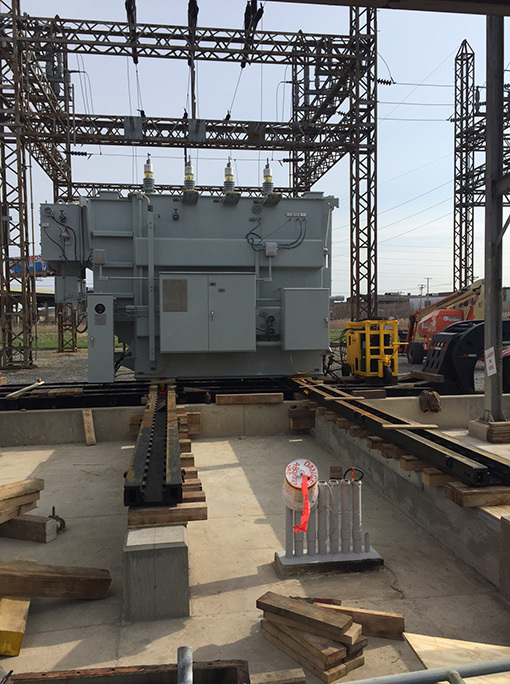 The task of moving giant transformers in a facility surrounded by live electricity can be daunting and dangerous without proper planning, the right equipment, and experienced personnel. 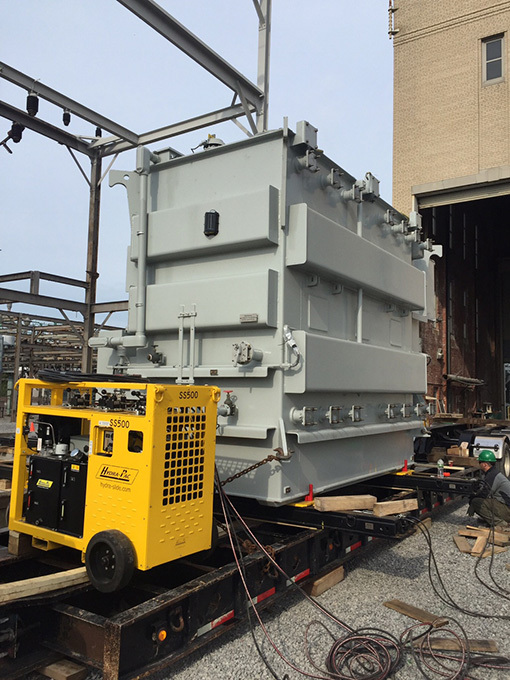 The key equipment used in this project was a brand new 500 ton capacity Hydra Slide jack-and-slide system. This system enables the smooth, seamless, and safe movement of large, heavy equipment that utilities demand. After weeks of detailed planning, the project began and was completed without a hitch. By continuously investing in such specialized equipment, this illustrates the commitment and respect for this important market that the Clark Companies have become proficient at. As with all equipment that Clark acquires, careful study precedes any purchase to make sure it is industry leading and appropriate for the high expectations for utility companies. Public and private utilities need professional expertise to complete these critical maneuvers, and Clark is continually making the necessary investments to help maintain the services that we all use every day. Clark Rigging was recently involved in a very successful public/private partnership project. The New York State Thruway Authority desperately needed to replace a damaged bridge on the I-190 overpass interchange, located just outside of the City of Buffalo. This is an extremely busy section of expressway, and the repair could not significantly interrupt traffic in a chaotic shut down. State engineers had initially brainstormed a plan which proposed using a very large crane to sit along side the thruway and reach over traffic lanes to remove and replace the damaged bridge span. The strict parameters set a time line that minimized thruway traffic delays. Unfortunately, state officials did not realize the scope of work that would be needed to use this approach. In meetings with private contractors, it was evident that the state engineer’s plan wasn’t feasible due to the huge financial cost and time consideration. 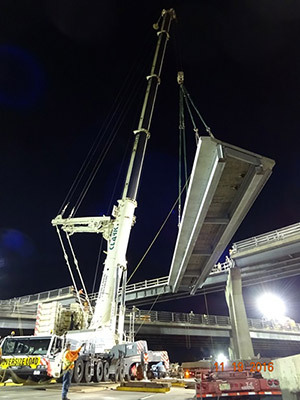 To alleviate this, Clark Rigging suggested the use of a large mobile crane to perform the work while positioned on the thruway directly under the overpass. It became obvious that this idea could meet all the goals of the state plan, but in a much less expensive and shorter time frame. State engineers now realized that with the right contractor and equipment, the entire bridge section could be removed and replaced with minimum disruption to thruway traffic. A detailed plan was established between Clark Rigging and the New York State DOT to work through the night hours when traffic is typically at a minimum. 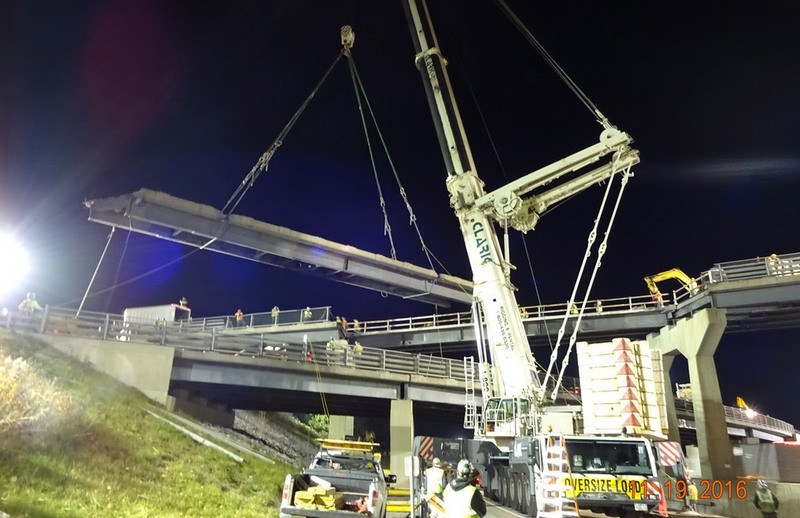 With detailed planning and the usual professionalism of Clark Rigging’s personnel, a 600 ton Demag AC 500-2 mobile crane was quickly mobilized to remove and replace the bridge section during one twelve hour shift. Everything went as planned, as crews and equipment worked tirelessly on through the night until completion. The entire project proved to be extremely successful, and normal traffic resumed by the morning hours. Because of the efficient results by working together, our hope at Clark Rigging is that these public/private endeavors will become the norm. 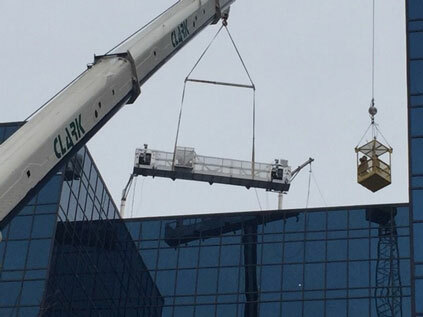 Clark specializes in finding solutions to unusual lifting projects and continues to be relied on for their great efforts to get the tough jobs done safely. It’s what Clark has done for six decades and continues to strive for in the future. Recently the University at Buffalo had a big problem. A 40-year old transformer failed and threatened the power supply to the huge athletic complex in Alumni Arena. UB is a division one competitor in the midst of an active season of sports. The roof mounted transformer (one of two) needed to be replaced as soon as possible. If the remaining transformer failed, the facility would become paralyzed. Years back, the university wisely anticipated for such a problem, and then prepared for this unfortunate outage by calling on the reputable team of Clark Rigging and O'Connell Electric to rig a spare transformer unit into nearby storage. So when the transformer went down, both companies were called upon again and responded immediately. Shawn Foti received the initial call from O'Connell and promptly met with anxious UB staff who explained the significance of the problem. After making careful measurements and observing the site, Shawn laid out a workable plan to remove and replace the transformer. Noting that the 25,000 lb. unit was located on the roof of an enormous building, it was determined that this work would require Clark's largest crane (600 ton) with special attachments to fulfill this time sensitive project. Once the plan was accepted, the wheels literally started turning. 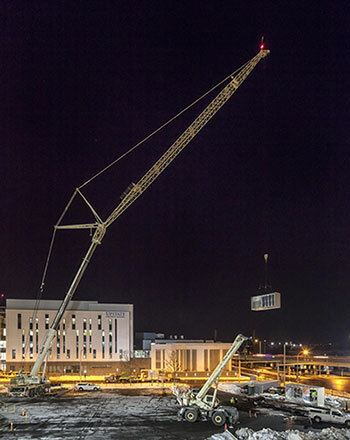 The professionalism of Clark's personnel made it possible to get the crane and its' 14 truck-loads of components on site, and be erected within one day. The logistics were challenging to say the least. Trying to fit a huge crane in a small area, assemble it, and be ready to go at a busy college campus took intense planning. With the experience and support of all Clark's trusted team, Shawn knew it could be done and promised the customer that Clark would complete the swap out in UB's time requirement. The relieved staff at UB could now watch as Clark and O'Connell took over and delivered as promised. This is why our customers exclusively use Clark Rigging. They know if a critical situation arises, Clark will be there with whatever it takes. The huge fleet of cranes and equipment, to the experienced project managers and impressive safety program, Clark Rigging can accomplish the most aggressive projects consistently. Clark has so many worthy projects that happen day in and day out that it's great to mention just how things get done when it's crunch time. Clark Rigging is very proud of its ability to achieve the results that make difficult situation look routine. Our customer’s success makes Clark Rigging a success!